Protecting your desktop computer in today's environment is challenging. Any type of desktop lock will help combat opportunity theft. Computer locks are your fastest and most popular security solution. We also offer computer security enclosures, PC Tab Alarm System, and accessories. If you are unsure which computer security solution is best for your unique situation, give one of our 'situation solvers' a call and we will be glad to help you! Our Guardian desktop lock kits allow you to secure up to 3 pieces of equipment with one kit. Built in the USA and available in any key option you need. We offer computer lock boxes to take care of your server security needs, including server enclosures, computer lockers, and custom pc enclosures for those hard to secure items. The PC Tab Alarm system provides a unique way to secure multiple computers in a computer lab and alert you to possible theft by contacting a Security Department, Monitoring Service, or whomever you designate. When a cable just isn't enough! 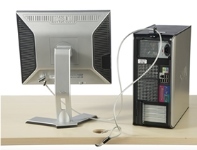 These computer lock accessories can be used to add additional attachment options and security for additional pieces of equipment.